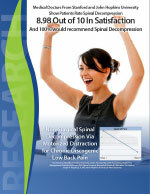 What is the success rate of spinal decompression? 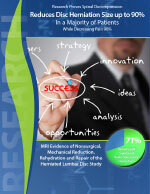 Most research has shown spinal decompression to be successful in 71% to 89% of patients. More than 10 different research studies have been conducted with all of them showing good results for patients treated with spinal decompression. 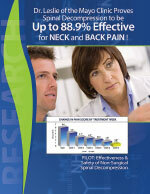 Here is a summary of some of the research studies performed on spinal decompression. True non-surgical Spinal Decompression Therapy was developed to provide a non-invasive option for low back and neck pain caused by herniated, bulging and degenerated discs. American Journal of Pain Management studied the Long-term Effect Analysis of Spinal Decompression Therapy in Low Back Pain: It was A Retrospective Clinical Pilot Study done in July 2005 by C. Norman Shealy, MD, PhD; Nirman Koladia, MD and Merrill M. Wesemann, MD. They observed the following Outcome: Of 24 study participants, each reported consistent pain relief and continual improvement of symptoms one year later. Improvement in pain continued after the treatment sessions were completed. 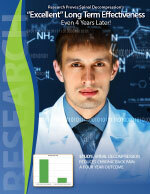 In Practical Pain Management from Technology Review. April 2005. Vol. 5, Issue 3. C. Norman Shealy, MD and PhD. Found that spinal decompression treatment leads to satisfactory pain relief and improved quality of life in up to 88% of patients-many of whom have failed other conventional approaches. Based on the authors review of recent study results, spinal decompression appears to be the current optimal recommendation for most lumbar pain syndromes. In an article from the Journal of Neurological Research entitled Vertebral Axial Decompression for Pain Association with Herniated or Degenerated Discs or Facet Syndrome from April 1998 Vol. 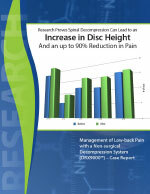 20, NO.3, E. Gose, PhD; W Naguszewski, MD; R. Naguszewski, MD., found the following from spinal decompression: Pain, activity and mobility scores greatly improved for 71%of the 778 patients studied. The authors consider VAX-D to be a primary modality for low back pain due to lumbar herniations, degenerative disc disease, and facet arthropathy. The authors concluded that post-surgical patients with persistent pain or Failed Back Syndrome should try VAX-D before further surgery. Does the success of spinal decompression treatments last or does the pain just come right back when a patient is done with treatments.